Справочные материалы для ревматолога. Trail guide to the body. Путеводитель по человеческому телу. 54 основные мышцы. РЕВМАТИЗМ. Острая ревматическая лихорадка, болезнь Сокольского-Буйо. arrhythmia: sinus tachycardia, atrial fibrillation (most commonly in stenosis of the mitral valve), superventricular or ventricular (less commonly) extrasystole, atrioventricular heart block. Low-frequency middiastolic murmurs. They are best heard in the left lateral decubitus at an expiration after holding your breath. They are most commonly heard after the 3rd heart sound or they may fuse with it. Basal protodiastolic murmurs are typical of aortal regurgitation. They are typically heard right after the 2nd heart sound. These are high-frequency heart murmurs and have a blowing, subsiding nature. They are best heard along the left margin of the breastbone after a deep expiration when the patient bends forward. acute fibrinous (pericarditis sicca) pericarditis. It is characterized by an acute onset, severe pain (sometimes retrosternal pain, abdominal pain), fever, pericardial murmurs. exudative (serous) pericarditis. It is characterized by coronary pain, dyspnea (corresponding to the amount of fluid), tachypnea, orthopnea. As soon as fluid is accumulated, the pain subsides, pericardial friction rub subsides or disappears, muffled heart sounds are heard. Reversibility of the articular syndrome. – Increased amount of alfa2-globulins >10% (more than 10%); – Increased amount of gamma-globulins >20% (more than 20%); – Increased amount of plasma fibrinogen (>0.5 g%); – Elevated C-reactive protein; – Progression of the values yielded by diphenylamine test; – Increased amount of seromucoid. For definitive diagnosis other lab tests, such as bacteriological analysis of the throat swab may be helpful. It helps to reveal beta-hemolytic Streptococci (BHSC). However, positive results of microbiologic tests do not indicate true infection from mere carriage of the organism. Commercially distributed group A streptococcal antigen detection kits for a rapid estimation of BHSC-antigens are often used. Serologic tests indicate high titres of anti-streptococcal antibodies, such as antistreptolysin-O (ASO), antistreptokinase (ASK), antistreptohyaluronidase (ASG) and, what is more important, an elevated titer of these antibodies. Diagnosis. Making a diagnosis of acute rheumatic fever is somewhat difficult, because there are not any specific tests for definitive diagnosis. Diagnostic criteria of rheumatism developed by Kisel-Johnes and supplemented by Nesterov, have been used since 1940. They have been revised by the American Heart Association (AHA) American Rheumatology Association. Diagnostic criteria of rheumatism developed by Kisel-Johnes and revised by the American Rheumatology Association (2003). Carditis Polyarthritis Chorea Erythema annulare Subdermal rheumatic nodules Clinical manifestations: – arthralgias; – fever. Laboratory studies: – elevated acute phase reactants: – elevated ESR; – elevated C-reactive protein; Other tests: – prolonged PR interval; – symptoms of mitral/aortal regurgitation on Doppler-echocardiography. A throat culture with positive results for Streptococcus or positive results of a rapid estimation of BHSC-antigens. 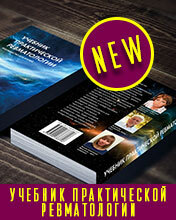 Increased or increasing titres of antistreptococcal antibodies, such as ASO, anti-DNAase B. Diagnosis: ARF: carditis, polyarthritis, extent of activity III, CFI. Recurrent rheumatic fever: carditis, extent of activity I, combined mitral valvular disease, CI II. Rheumatic heart disease: combined mitral-aortal valvular disease, CI II B. Rheumatic heart disease: rheumocarditis in past history. Early monosyndromal signs are typical. Indolent carditis is often observed. Neurological disorders, persistent arthralgias are common. Imaging Studies: cardiomegaly. Other Tests: coronary circulation disturbances, signs of myocardiosclerosis, arrhythmia (in recurrent rheumocarditis) are typical. Lab Studies: slightly elevated or normal ESR; C-reactive protein is not found or it is I plus; slightly elevated or normal gamma-globulin level; the values yielded by diphenylamine test are normal; the values of yielded by seromucoid test are also normal; titres of ASO, ASK, ASG are normal. High temperature is an early clinical manifestation. Carditis may be associated with circulation disturbances of the 1st and 2nd degree. Early symptoms of polyarthritis, monooligoarthritis and chorea may be observed. Imaging Studies: cardiomegaly. Other Tests: arrhythmia, prolonged PQ interval, coronary circulation disturbances. Lab Studies: neutrophil leukocytosis 8*109 – 10*109; ESR – 20 – 40 mm/h. C-reactive protein is I – III plus; the amount of alfa2-globulins is 11 – 16%; the amount of gamma-globulins is up to 21 – 23%; the values yielded by diphenylamine test are 0.25 – 0.3; the values yielded by seromucoid test are 0.3 – 06; 1.5 elevation of ASO, ASK, ASG titres. Fever is considered to be the major clinical manifestation. Other findings include: migrating polyarthritis, diffuse myocarditis, pancarditis. Some symptoms of pleuritis, peritonitis, rheumatic pneumonia, glomerulonephritis, subdermal nodules, erythema annulare, and chorea are typical. Imaging Studies: cardiomegaly, decreased contractility of the myocardium. Other Tests: arrhythmia and conduction disturbances. Lab Studies: neutrophil leukocytosis is higher than 10,0*109; ESR is more than 40 mm/h; C-reactive protein is III – IV plus; fibrinogen is more than 9-10 g/l; the values yielded by seromucoid test are more than 0.6; the values yielded by diphenylamine test are more than 0.35 – 0.5; the amount of alfa2-globulins is 17%; the amount of gamma-globulins is more than 23 – 25%; titres of ASO, ASG, ASK are 3 – 5 times higher than normal. At the decompensation stage where acute rheumatic fever is associated with active carditis. The initial dose of Prednisone should be 0.7 – 0.8 g daily increasing it to 1.0 mg/kg daily. The maximum dose should not exceed 20 – 30 mg daily. After 2 weeks the dosage is reduced by 2.5 mg every 5 – 7 days until complete withdrawal of the drug. Non-steroidal anti-inflammatory drugs should be administered during this period to prolong the anti-inflammatory treatment up to 9 – 12 weeks. Non-steroidal anti-inflammatory drugs (NSAD) are administered in rheumatic arthritis, chorea, mild and moderately severe rheumocarditis, in mild and moderately severe extent of the disease activity, in subacute indolent and latent course of the disease. Nowadays the derivates of indolacetic (Indomethacin) and arylacetic acids (Voltaren) are beneficial. The initial dose of the drug is usually 150 mg daily. Acetylsalicylic acid may be also administered. Doses of up to 3 –4 g daily are typically used. Ibuprofen may be also given 800 – 1200 mg daily reducing it up to maintenance dose. Aminocholine derivates are poor immunosuppressive agents and stabilizers of lyzosome membranes which help to prevent the destruction caused by proteolytic lizosomal enzymes. Patients with an indolent and recurrent course of the disease should be prescribed long-term administration of quinoline drugs, such as Chlorochin (Chingamin, Delagil). Doses of up to 0.25 mg twice a day are typically used. 0.2 g of Plaquenil twice a day are also beneficial. Antibiotics. In most patients with rheumatism and those who have chronic foci of streptococcal infection the use of antibiotics is justified. The doctor in charge decides on a certain antibiotic and determines the way of its administration considering the clinical situation. Benzylpenicillin is usually the first antibiotic to be administered. Doses of up to 1 500 000 to 4 000 000 activity units daily are typically used. Intramuscular injections are given for 10 – 14 days. If there are not any risk factors, such as burdened heredity, poor living conditions, etc., oral administration of Penicillin drugs are advisable. The course of treatment usually lasts for 10 days. These drugs include the following: Phenoxymethylpenicillin should be given 0.5 – 1.0 g 4 times a day, Ampicillin – 0.25 g 4 times a day, Amoxicillin – 0.5 g 3 times a day or 1 g twice a day. Amoxicillin is considered to be the most beneficial of all the above mentioned drugs, because it is as effective as Ampicillin and Phenoxymethylpenicillin, but it is more bioavailable. Cephalosporins I, such as Cephalexin, Cefradin, Cefadroxil 0.5 g 4 times a day, or Cephalosporins II, such as Cephaklor, Cephuroxim 0.25 g 3 times a day may be also used. If the patient is intolerant of Penicillin preparations, macrolide antibiotics may be used. Erythromycin is one of them. It may be given 0.25 g 4 times a day. There are some other new preparations, such as Azitromycin which should be given for 5 days increasing the dose from 0.5 g on the first day and by 0.25 g daily from the 2nd to 5th day. Roxitromycin should be given 0.15 g twice a day. The course of treatment usually lasts for 10 days. Cardiac glycosides are used if there are signs of congestive heart failure. In patients with severe carditis they are effective only in combination with anti-rheumatic drugs. Nitrates worsen the prognosis in patients suffering from rheumatism. Rehabilitation of patients with rheumatism in a local specialized rehabilitation centre (e.g. sanatorium) or at home (the patient is put on sick-leave for some days) (2-nd stage). This stage is important for consideration when rheumatism turns into an inactive phase. At this stage hormones are discontinued, the administration of non-steroidal anti-inflammatory drugs is controlled, and the drugs improving metabolism of the myocardium are administered. Specialists in physical and social rehabilitation work with the patients at this stage. Regular medical check-ups (3-d stage). The objectives of regular medical check-ups are the following: 1. Treatment of patients aimed at complete elimination of the active rheumatic process. 2. Symptomatic therapy of circulatory disturbances and receiving symptomatic therapy by patients with heart diseases. Ways of treating heart diseases. 3. Solving the problems of rehabilitation, work capability and employment of patients who had acute rheumatic fever. 4. Secondary prevention of rheumatism. Prevention of recurrences. Prevention. Primary prevention. The objective of primary prevention consists in organization of a complex of individual, social and national measures aimed at eliminating primary disease incidence, i.e. (that is) preventing healthy people from falling ill with rheumatism. The following factors should be focused on: I. Treatment of streptococcal infection: 1) Revealing the carriers ( bacteriologic examination in nasopharyngeal infection is obligatory); 2) Obligatory treatment of streptococcal nasopharyngeal infections with antibiotics. Beta-lactam antibiotics (adult dose – Amoxicillin 1.5 g daily for 3 doses; children dose 0.375 g daily for 3 doses; the course usually lasts for 10 days). Benzatin-benzylpenicillin should be considered if the patient is unable to take antibiotics orally. It should be also administered if the patient or one of his relatives had acute rheumatic fever, if the patient’s living conditions are poor, if there are outbreaks of BHSA-infection in pre-school establishments, at schools, hostels, in colleges, in the army, etc. If the patient is intolerant of beta-lactam antibiotics, macrolide antibiotics, such as Midekamycin, Roxitromycin, Erythromycin, Claritrimycin, Spiramycin, Azitromycin, are used and if the patient is intolerant of macrolides, lincosamines, such as Clindamycin, Linkomycin, are typically used. Antimicrobial therapy of recurrent BHSA-tonsillitis includes Amoxicyclin, Klavulanat, Clindamycin, Cefuroxim, or Aksetil. 3) Sanation of chronic foci of streptococcal infection. II. Education of the population about the necessity to visit the doctor in case of tonsillitis and pharyngitis. III. Taking measures aimed at strengthening the defensive forces of the human body (e.g. taking exercises, hardening, gymnastics, etc.). Secondary prevention. After finishing the course of treatment of acute rheumatic fever secondary prevention is carried out. 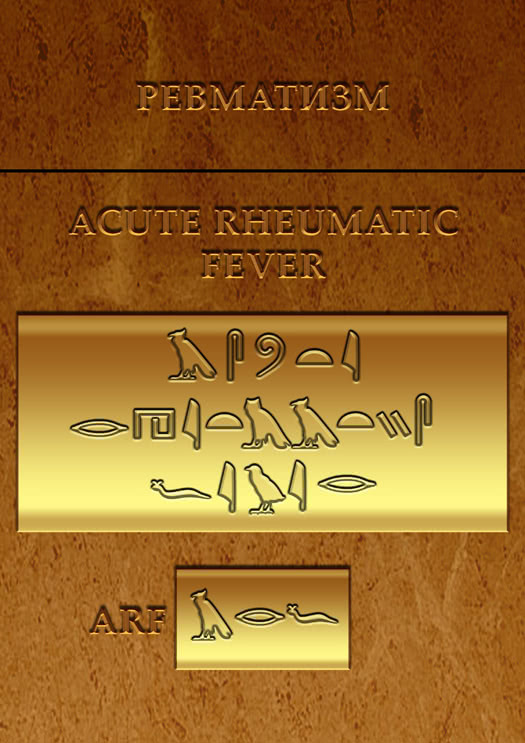 It is performed in order to prevent recurrences of the disease in people who had acute rheumatic fever. Antibiotics are the main means of preventing recurrent rheumatic attacks. Perspective antibiotics with a prolonged action are considered to be Benzylpenicillin antibiotics, such as Extencillin, Retarpen, Pendepon, Benzatin-benzilpenicillin which are administered 2 400 000 activity units once every 3 weeks. In this case intramuscular injections are usually used. The duration of secondary prevention should not exceed 5 years after the last rheumatic attack if acute rheumatic fever was associated with carditis. Secondary prevention should not exceed 3 years if acute rheumatic fever was not associated with heart involvement and the patient did not have chronic foci of infection. According to the WHO, if acute rheumatic fever is not associated with carditis, secondary prevention should not exceed 5 years. However, it should be completed earlier than the patient is 18 years old. Sometimes, however, it can be prolonged. Patients who had acute rheumatic fever associated with carditis should have secondary prevention till the age of 25. Patients with valvular heart disease and those who underwent a surgery correcting heart disease should have secondary prevention throughout the life. Pregnant women with rheumatism should be monitored by rheumatologist and obstetrician at an early gestational age. Pregnant women who had acute rheumatic fever should be continued on Bicillin prevention. However, if it had been completed by the time the woman became pregnant, it can be renewed at weeks 10 or 12 of gestation. The prognosis of the disease is determined by the efficacy of treatment of primary rheumocarditis and by the presence of complications.